PSTS has been continuously felicitated by way of awards and recognition by the trade bodies and port authorities. 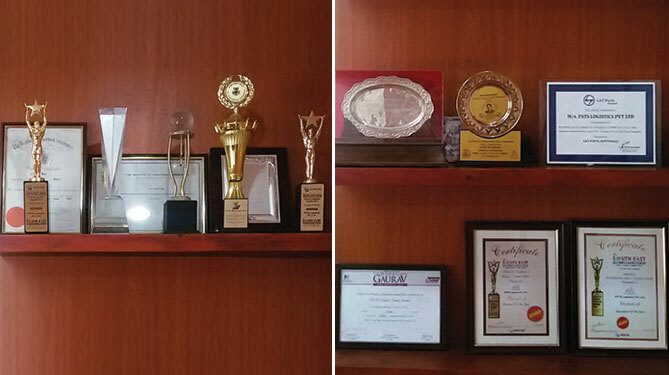 Our dedication and passion for excellence have taken us a long way. Year 2017-18: History repeats itself. PSTS wins Best Stevedore Award for the 5th consecutive year..
Year 2016-17: PSTS makes history. Wins Best Stevedore Award for the 4th consecutive year. Year 2015-16: PSTS wins Stevedore of the Year Award for third consecutive year. Year 2014-15: PSTS Logistics received "Stevedore of the Year Award" for the second consecutive term in the 3rd edition of Cargo Scope 2015 concurrent with 7th South East Cargo and Logistics Awards 2015. Year 2012-13: PSTS Logistics won "Stevedore of the Year Award" in the South East Cargo & Logistics awards 2013, instituted by EXIM India. The award was presented in a ceremony held at the Chennai Trade Centre, Chennai. YEAR 2012-13: PSTS Logistics was honoured with EXIM Service Award by Tamil Chamber of Commerce (TCC) on 26th April, 2013. His Excellency, The Governor of Tamilnadu, Dr. K Rosaiah, gave away the award to Mr. Arjun Sankar, Executive Director, PSTS Logistics in the presence of Mr. G.K.Vasan, Union Minister of Shipping, at a function in Chennai. YEAR 2011-12:PSTS won the award for handling the highest tonnage of break-bulk cargo in the port of Chennai by Tamil Chamber of Commerce. Award was handed over to Mr. J Ganesh Ram (JMD) by the Governor of Tamil Nadu Dr. K. Rosaiah. YEAR 2011-12: PSTS was honoured with "Best Performance Award" by port of Chennai. Award was received by Mr. J. Ganesh Ram in the special function organized by Port of Chennai. YEAR 2011-12: PSTS won the "D&B – Axis Bank Business Guarv SME Award 2011" for the Logistics sector. Our Chariman Mr. Udaysankar received the award in the function held in Mumbai ITC Hotel on 11th Nov, 2011. YEAR 2010-11: PSTS was awarded as "BEST STEVEDORE" by M/s Sterlite Industries. Award function was held at Le Meridian, Chennai. YEAR 2010-11: PSTS was given Traffic Performance Award on 19th Nov, 2011 by V.O. Chidambaranar Port Trust for handling highest volume of Iron and steel cargo as stevedore. Award was received by Mrs. Mehana, Joint Director from Mr. G.K. Vasan, Union minister of shipping. YEAR 2009-10: PSTS received the award for Highest Tonnage of cargo handled as Stevedore in the port of Tuticorin. Award was received by Mr. T. Udayasankar, Chairman & Managing Director from Hon. Minister of Social welfare Smt. P. Geetha Jeevan. YEAR 2009-10: PSTS received award for handling Highest Volume of Coke handled in Single day. Award was received by Mr. U.Satishkumar, Executive Director from Hon. Minister of Social welfare - Tamilnadu, Smt. P. Geetha Jeevan. YEAR 2008-09: PSTS won the award for "Excellence in Traffic Performance" from Tuticorin Port Trust for handling highest tonnage of cargo excluding thermal coal as stevedore. YEAR 2007-08: PSTS won award for "Excellence in Traffic performance" for highest amount of labour levy paid as stevedore. YEAR 2007-08: PSTS won the award for handling highest tonnage of Import Break-bulk cargo as CHA. This award by given away by Indian Chamber of Commerce & Industry, Tuticorin. Mr. Udayasankar received the award from Hon Minister of Shipping, Mr. G.K. Vasan.